Sydney is the largest city in Australia and is a popular tourist destination as well as being the major business destination in the country. There are lots of self contained places to stay in Sydney ranging from budget apartments right through to luxury serviced apartments. 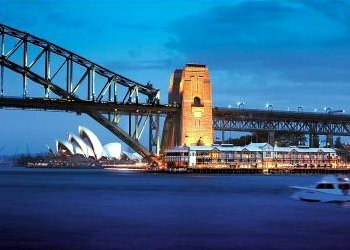 The Sydney city has a number of iconic tourist attractions such as the Harbour Bridge, Opera House, Bondi Beach and Darlign Harbour. When you stay in Sydney there are also lots of place for dining out, shopping and other activities that will not only make your stay a memorable one but will also make you want to come back to Sydney again and again. Oaks Goldsbrough - Oaks Goldsbrough in the Sydney CBD provides luxury studio, 1 & 2 bedroom self contained serviced apartments for leisure & corporate travellers close Darling Harbour & Sky City Casino. The Oaks Goldsbrough Apartments has a magnificent neo-classical facade originally built in 1883 and offers travellers a charm reminiscent of Sydneys colourful past. Inside the Oaks Goldsbrough Sydney has been fully renovated and stylishly furnished to provide guests with outstanding hotel facilities and the spaciousness that you would expect from fully self contained apartment accommodation. Napoleon on Kent - The Napoleon on Kent Serviced Apartments in the Sydney CBD offer affordable studio, 1 & 2 bedroom self contained apartments. Situated in the heart of Sydney's central business district, Napoleon on Kent is a modern, self contained apartment complex ideally located at the Harbour Bridge end of Kent Street just a short stroll from the historic Rocks area and just minutes from Darling Harbour, Circular Quay and all that Sydney has to offer. Perfect for the business and leisure traveller, Napoleon on Kent offers a choice of spacious studio and one bedroom self contained apartments. Fiori Apartments - Fiori Apartments in Parramatta provides 1 & 2 bedroom self contained apartment accommodation in the heart of the Parramatta CBD, making it the ideal accommodation for business, leisure & corporate guests. The Fiori Apartments offer the discerning guest an ultra convenient location, just a breath away from the CBD, railway station, bus interchange, Westfield Shopping centre, Chinatown, restaurants, cafes, schools and parks. APX World Square - The APX World Square in Haymarket, Sydney provides luxury studio, 1 & 2 bedroom self contained apartments ideal for business & leisure travellers & corporate relocations. Further facilities include secure on-site car parking, indoor and ourtdoor swimming pool and gymnasium. APX World Square can accommodate up to 10 delegates in the Meeting Room and caters for meetings. APX World Square's fantastic location and style of apartments will delight the most discerning corporate and leisure traveller. Azure Apartments Sydney - The Azure Apartments Potts Point provides budget studio & 1 bedroom self contained apartments that are perfect for discount holiday & business accommodation. Business clients are also well catered for at the Azure Apartments with high speed wireless internet connection, facsimile facilities and photocopy service. The Azure Executive Apartments Accommodation Sydney offer ideal central Sydney apartments accommodation at affordable rates for business and leisure travellers. Milson Serviced Apartments - Milson Serviced Apartments are located in Milsons Point and are fully furnished, featuring a seperate lounge/dining room including television, stereo/CD player, direct dial telephone and Foxtel TV with 20 channels, a seperate master bedroom including a Queen bed, a fully equipped kitchen with micowave and dishwasher, private ensuite bathroom with shower and bath, full laundry facilities, security car parking and private furnished balcony with views of either the surrounding district, Lavender Bay or panoramic Harbour views. The Milson Serviced Apartments facilities include a heated indoor pool, a fully equipped gymnasium and FREE car parking. Oaks Hyde Park Plaza - The studio, 1 and 2 bedroom apartment accommodation at the Oaks Hyde Park Plaza is ideally located in the heart of the Sydney CBD close to Darling Harbour. These Sydney apartments are ideally positioned between the city centre and trendy Oxford Street and provide easy access to the numerous shops, restaurants and department stores in the Sydney CBD. Spacious suite-style accommodation and fantastic guest facilities including an indoor swimming pool, spa, sauna and gym make the Oaks Hyde Park Plaza your new home away from home in Sydney. Quest on Dixon Darling Harbour - Quest on Dixon Darling Harbour in Sydney has a range of luxury studios & 1 bedroom self contained serviced apartments. At the Quest On Dixon Darling Harbour, you will find yourself in the heart of the CBD with easy access to the commercial hubs of Sydney, close to many of Sydney's favourite attractions - an easy stroll to the gourmet, shopping and entertainment delights of Darling Harbour, Chinatown and the Spanish Quarter and the Sydney Exhibition & Convention Centre. Quest on Dixon Darling Harbour's fantastic location modern, well equipped apartments are perfect for the corporate & leisure traveller. Park Regis Concierge Apartments - The apartment accommodation at the Park Regis Concierge Apartments Sydney consists of studio and 1 bedroom suites in Cremorne on Sydney's North Shore. The Oaks Concierge Apartments provide leisure and business travellers with beautifully appointed serviced studio and 1 bedroom apartments all with views of the Sydney Harbour or North Shore area. Within the Oaks Concierge development there are cafes, restaurants, retail shops, full hotel facilities and even a nightclub to ensure that you are well looked after on your next stay in Sydney. Kirribilli Village Apartments - Spacious, self contained apartment accommodation located close to Sydney Harbour Bridge and Sydney CBD. With one bedroom and two bedroom apartments on offer in Sydney the Kirribilli Village Apartments provide the ideal accommodation for the leisure traveller exploring the sights of Sydney, the business traveller visiting Sydney as well as those needing temporary accommodation whilst relocating to the city of Sydney. Located on the foreshore of Sydney Harbour, why miss out on those spectacular sights Sydney has on offer. Rydges North Sydney - Rydges North Sydney offers luxury hotel & suite accomodation, perfect for the discerning leisure and business traveller, close to the North Sydney business district, Sydney Harbour Bridge & the Sydney CBD. All accomodation at the Rydges North Sydney includes include air conditioning, a mini bar, coffee maker, hairdryer, room service, safe deposit box, colour TV, cable TV, telephone, ironing facilities and views over the cricket pavilion of North Sydney Oval or south across the corporate precinct and the Harbour. The friendly professional services include 24 hour reception, room service and a dedicated Business Centre to accommodate every need. Sydney South Waldorf Serviced Apartments Chippendale - Sydney South Waldorf Serviced Apartments Chippendale offers self contained studios and 1 bedroom apartments accommodation, ideal accommodation for business & leisure. Guests of the Sydney South Waldorf Serviced Apartments Chippendale have easy access to restaurants, Sydney sport facilities, coffee shops and entertainment facilities within 10 minutes walking distance from your apartment. If you need to be away from home for a day, a month or more, come to the Sydney South Waldorf Serviced Apartments Chippendale. The Waldorf Sydney South looks forward to welcoming you and ensuring your stay is an enjoyable and memorable one. Quest Rosehill - The Quest Rosehill in Sydney provides luxury studio, 1, 2 & 3 bedroom self contained serviced apartments accommodation. Further services and facilities include chargeback facilities at nearby restaurants, restaurant delivery service, bottleshop delivery service, pantry shopping service, breakfast starter packs, reception, dry cleaning service, wireless Broadband, baby sitting service and laundry service. Quest Rosehill is located in the heart of the western CBD on the doorstep of cultural and entertainment scene, shopping and events. Make your next stay at Quest Rosehill. Comfort Inn Suites Burwood - Comfort Inn & Suites Burwood, Sydney has a range of luxury accomodation in both serviced apartments and motel suites, only 11 kms from Sydney CBD and 12 kms from the Sydney International and Domestic Airport. The Comfort Inn & Suites Burwood is also close to Sydney Olympic Park (Homebush Bay) and numerous restaurants, shops and cafes. We are conveniently located in Sydneys Inner West, making it the ideal gateway and central location allows our guests to commute to all parts of Sydney with ease, including Sydneys Central Business District. The Sebel Residence Chatswood - Quality 1 bedroom and 2 bedroom apartment accommodation in the North Shore of Sydney that is fully self contained and close to public transport. Located on the fashionable North Shore of Sydney, The Sebel Residence Chatswood provides comfortable and quality accommodation for both leisure and business travellers alike. This Sydney accommodation combines the luxury and freedom of your own self contained apartment with many hotel amenities and services, with close proximity to the major retail shopping area and railway station of Chatswood Business District. Quest Potts Point - The Quest Potts Point in Sydney has quality hotel & serviced studio apartments providing discount leisure & corporate accommodation close Sydney CBD & Darling Harbour. Quest Potts Point Serviced Apartments Sydney is the perfect central location for sightseeing around Kings Cross and other parts of Sydney including the Sydney Opera House, Botanical Gardens, Darling Harbour, Bondi Beach and the Sydney Harbour Bridge. Quest Potts Point Sydney Hotel & Serviced Apartments offers quality accommodation in a fantastic Sydney location to suit the discerning corporate and leisure traveller alike. Parramatta Waldorf Apartment Hotel - The Parramatta Waldorf Apartment Hotel has affordable studios & 1 bedroom self contained serviced apartments offering travellers discount Parramatta leisure & corporate accommodation. The Parramatta Waldorf Apartment Hotel also caters well for business corporate clients with wireless internet and data port in each studio and 1 bedroom apartment, photocopying service, faxing facilities and extensive meeting facilities. The Parramatta Waldorf Apartment Hotel - luxurious and affordable self contained hotel apartments accommodation for business, leisure travelers and families in the heart of Parramatta. Parkside Apartments Parramatta - The brand new 2 bedroom apartments at the Parkside Apartments in Parramatta provide affodable, discount accommodation for business executives and families close to the Parramtta city centre. The Brand New 2 bedroom apartments at Parkside are conveniently located within walking distance of the Parramatta city centre, which is 23 kms west of the Sydney CBD. With the Homebush Stadium, Parramatta Railway Station, local shops, clubs, restaurants and cafes close by the Parkside Apartmetns Parramatta is the ideal accommodation for both business and leisure. Breakfree on George Sydney - Breakfree on George provides luxury studio, 1 & 2 bedroom self contained serviced apartments for leisure & corporate travellers. Business facilities include broadband internet access, ISD/STD direct dial phone and voice mail message service in all apartments, a business centre, secretarial services, faxing facilities and photocopying services. The modern apartment-style accommodation offered at BreakFree on George Sydney caters to all needs from those of the corporate business traveller, through to the leisure traveller looking for a romantic weekend escape or a fun filled family getaway. The York by Swiss Belhotel - The York by Swiss Belhotel in the Sydney CBD is one of Sydney's best located suites & residences providing luxury studios, 1 & 2 bedroom apartment suite accommodation in the heart of the Sydney CBD. The York by Swiss Belhotel is one of Sydney's finest apartment hotel and is just a short stroll from Sydney’s central business district and famous tourist attractions such as Sydney Harbour, The Rocks, Darling Harbour, theatres, galleries and fine restaurants. Mantra 2 Bond Street Sydney - Mantra 2 Bond Street in the Sydney CBD provides luxury studio, 1, 2 & 3 bedroom self contained serviced apartments for leisure & corporate travellers. It is situated close to the Sydney Opera House, Sydney Harbour Bridge and Rocks precinct. Further facilities and services include 24-hour reception, concierge, room service, undercover carparking, laundry service, baby-sitting service, Free DVD hire, security, daily housekeeping, car rental, airport transfers, restaurant charge back facility with several nearby restaurants, luggage storage, lift, cot hire and tour desk. Perfect for overnight, short-term and long-term business corporate and leisure travellers, the Mantra 2 Bond Street Sydney Apartments offers guests sophisticated, modern and comfortable accommodation right in the heart of bustling Sydney. Mantra Parramatta - The Mantra Apartments in Parramatta is a two minute walk from Parramatta Railway Station and Westfield Shopping Town. Offering a range of quality hotel facilities, these quality apartments in Sydney are perfect for both corporate and leisure tourists. The Mantra Apartments are superbly positioned to take advantage of the many things to see and do in the Parramatta area as well as the rest of Sydney. Fraser Suites Sydney - Fraser Suites Sydney offers 5 Star luxury studio, one and two bedroom hotel suite accomodation in the heart of the Sydney CBD close to Darling Harbour, Cockle Bay and Chinatown. Fraser Suites Sydney, just 20 minutes by taxi from Sydney's Kingsford Smith Airport, is the ideal luxury Sydney apartment style hotel, offering a fresh new design and a new level of luxury, space, convenience and lifestyle facilities befitting discerning business and leisure travelers. Our satisfaction is to provide a home away from home where you are treated as part of the Fraser's family and feel much more than just a guest. Oaks on Castlereagh - Oaks on Castlereagh in the Sydney CBD offers traveller the choice of studio, 1 & 2 bedroom self contained executive apartments accommodation, ideal corporate & leisure travellers. You can visit nearby Sydney attractions including the Sydney Opera House, Royal Botanical Gardens and Sydney Tower - all only a stroll away from this conveniently located Sydney accommodation! Whether you choose a studio, 1 or 2 bedroom apartment you are guaranteed superior service and comfort. Oaks on Castlereagh in Sydney presents unparalleled, executive apartments which are the perfect mix of business and pleasure for your visit to Sydney. Mantra Chatswood - The Mantra Apartments in Chatswood has a range of luxury studioxs, 1 & 2 bedroom self contained serviced apartments close to the Sydney CBD, Opera House and Harbour Bridge. Mantra Chatswood is the ideal home away from home for both leisure and business traveler alike, including those who are relocating or on a long stay work assignment. Mantra Chatswood is the ideal choice for discerning ravelers to Sydney's North Shore. Macleay Serviced Apartments - Fully self contained apartment accommodation located in Potts Point and conveniently close to Sydney Harbour and Sydney Harbour Bridge, Sydney CBD, Sydney Opera House, the Rocks, Darling Harbour and Circular Quay. Apartment accommodation during your next stay in Sydney, offering a range of hotel accommodation in Potts Point, Macleay Serviced Apartments/Hotel provides friendly and attentive service, and can assist in planning your sightseeing to Sydney Opera House, Darling Harbour, Bondi Beach, the Blue Mountains, the list is endless in Sydney. Manly Beachside Apartments - Manly Beachside Apartments are located close to Manly Beach and provides clean, comfortable, budget, affordable studio apartments mins from magnificent Manly beach & close to all Sydney attractions. The kitchenettes are equipped with a fridge, microwave, kettle, toaster and all utensils. Enjoy complimentary tea/coffee upon arrival. Linen, including towels, is also provided. Our goal is to ensure that your stay in Manly is comfortable and enjoyable and we look forward to the opportunity of hosting you. Quest North Ryde - The Quest North Ryde provides affordable studio, 1 & 2 bedroom self contained serviced apartments at discount rates. Business facilities include high speed internet access and dedicated desk with direct dial telephone lines for fax/modem access in every apartment, the Quest secretarial service, business center, faxing facilities, computer printing and photcopying service, conference facilities and Free shuttle bus to Riverside Corporate Park, Macquarie University, Macquarie Park Business Precinct, Macquarie Park Sopping Center and Lane Cove Business Park. At the Quest Serviced Apartments North Ryde you can enjoy the conveniences of location, modern facilities and the extensive range of guest services, ideal for the discerning business and leisure traveller. Metro Apartments on Darling Harbour - The Metro Apartments on Darling Harbour is a fantastic Sydney accommodation for both business and holiday travellers. The Metro Apartments on Darling Harbour comprises fully serviced one bedroom loft style apartments complete with large ceiling to floor windows providing most of the rooms with expansive views of Darling Harbour. The Star City Casino and Sydney Convention Cnetre are also located close by to these Darling Harbour Apartments. The 150 Apartments - The 150 Apartments in the Sydney CBD offers leisure & corporate guests luxury Sydney apartment accommodation at heavy discounts. Choose from self contained studio apartments and 2 bedroom apartments that are ideally situated across from Hyde Park in Sydney city. This stylish Sydney accommodation is ideal for extended visits to Sydney with easy access to public transport, shops, cafes, restaurants, nightlife and all city attractions. Quay Grand Suites Sydney - Luxury Sydney accommodation at Quay Grand Suites Sydney offering all-suite hotel accommodation on Circular Quay close to the Opera House and Sydney Harbour Bridge. Situated on the eastern shore of Circular Quay and offering all-suite accommodation with stunning views of Sydney's skyline and harbour, Quay Grand Suites Sydney offers a 5 star experience not to be missed. Each accommodation suite comprises of a spacious lounge/dining room, a choice of one or two bedrooms, fully appointed bathroom with spa, fully equipped gourmet kitchen with integrated laundry and a private balcony. Bondi Beach Breeze Executive Apartments - The luxury family sized 3 bedroom apartment at the Bondi Beach Breeze Executive Apartments in Sydney is the perfect accommodation for corporate business guests and people relocating to Sydney. With 3 large bedrooms, quality fixtures and fittings and a wonderful location close to the world famous Bondi Beach this luxury Sydney accommodation has it all. The Bondi Beach Breeze Apartments Sydney also offer guests great value discount rates for extended stays. Waldorf Apartment Hotel Pennant Hills - Offering discount studio apartment accommodation in Sydney's West the Waldorf Apartment Hotel Pennant Hills is the place to stay with special rates available online. This unique and luxurious Waldorf Apartment accommodation provides self contained studio apartments that are fully furnished, feature full kitchen facilities and free on-site car parking. Portofino Apartments North Sydney - Portofino Executive Apartments is in the Lower North Shore and have studio, one and two bedroom apartments to choose from, located in handy locations close to public transport, shopping centre and restaurants. Ideally positioned only 2 Kms from the Sydney CBD the Portofino Apartments provides a range of apartments close to public transport, shopping precincts, restaurants and eateries. Caulta Apartments - The Caulta Apartments in Parramatta Sydney are furnished, self contained apartments that are available at discount rates for short or long-term stays. Ideal for business travelers or vacation rent these Parramatta apartments are close to public transport, restaurants, cafes, shopping centres, Parramatta Stadium, cinemas, Parramatta Park and the Parramatta Explorer. Ultimate Apartments Bondi Beach - Apartments accommodation located in the Sydney central Bondi close to Sydney's ultimate beach, Ultimate Apartments fully furnished studio apartments catering for short and long stays. Conveniently located in the central Bondi village and within a short stroll of Sydney's ultimate beach, Ultimate Apartments is perfect for any type of stay. We have 45 fully furnished studio apartments catering to couples, singles and families who wish to stay for short or longer terms. Quest Campbelltown - Quest Campbelltown Serviced Apartments provides quality studio, 1, 2 & 3 bedroom self contained apartments at discount prices. Quest Campbelltown Serviced Apartments in Sydney also caters for corporate and business clients with wireless broadband and dedicated direct dial telephone lines for fax/modem access in all apartments, meeting facilities, secretarial services, facsimile, photocopying and computer printing services. Quest Campbelltown Serviced Apartment Accommodation is Sydney's affordable, quality, serviced apartment accommodation in South West Sydney, ideal for holiday makers and corporate business travellers. Quest Manly - The Quest Manly Serviced Apartments provides studio, 1 & 2 bedroom self contained apartments that are ideal for leisure & business stays. Quest facilities include valet laundry service, valet dry-cleaning service, pantry shopping service, secretarial service, photocopying service, faxing facilities, baby sitting service, tour desk, concierge services, photocopy service, lift, 24 hour front desk, free car parking, daily newspapers, conference facilities, luggage storage, gym and sauna. Quest Castle Hill - Quest Castle Hill is located in Sydney Hills and provides quality studio, 1 2 & 3 bedroom serviced apartments for holiday & business travellers. Corporate clients are also well catered for at the Quest Castle Hill Serviced Apartments with dedicated telephone lines for fax/modem access and wireless broadband internet available in every apartment, faxing facilities, photocopying services, secretarial services, internet connectivity, computer modem hookups and conference facilities. With all the comforts of home and the convenience of its location, Quest Castle Hill is the perfect accommodation choice for the corporate traveler to Norwest Business Park. Quest Cronulla Beach - Quest Cronulla Beach has affordable studio, 1 & 2 bedroom self contained serviced apartments providing discount Cronulla beachside holiday accommodation. To accommodate your professional needs, each apartment provides guests with internet access and dedicated telephone lines for fax/modem access, as well as the opportunity to utilise the Quest secretarial service, faxing facilities and photcopying service to add that finishing touch to any business request. The apartments at Quest Cronulla Beach are ideal for corporate guests, leisure travellers and families. Annam Apartments - The Annam Apartments in Potts Point Sydney gives you the choice of luxury apartments that suit all types of leisure & corporate travellers. The Annam Suites properties are designed to provide both a dynamic living space and a unique accommodation experience whether you are a business or holiday traveller. These quality Sydney apartments are ideally located in Potts Point, just a short distance from the Sydney CBD and everything that Sydney has to offer. Waldorf Apartment Hotel Sydney - The Waldorf Apartment Hotel has affordable 1 & 2 bedroom self contained serviced Sydney CBD apartments available at reasonable rates. The spacious 1 and 2 bedroom apartments offer business and leisure travellers great facilities including a separate lounge, fully equipped kitchen and laundry, large balcony with expansive views of the city and use of the Waldorf's roof top pool, spa and BBQ area.